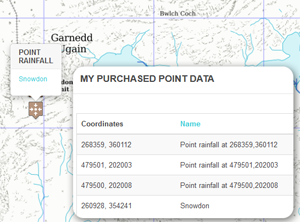 A new Point Data Extraction product for rainfall, soil and climate data has been added to the Flood Estimation Handbook (FEH) Web Service. The Flood Estimation Handbook (FEH) and associated software is the industry standard for estimating UK flood risk. The new product allows drainage engineers, SuDS practitioners and developers to better assess suitable drainage design and development viability. It gives access to the latest methodology for rainfall estimates (FEH13), and soil and climate properties for any point on the land surface. It works alongside the standard fluvial catchment data retrievals from the FEH Web Service. FEH methods are used in the planning and assessment of flood defence schemes, the design of bridges, culverts and reservoir spillways and the planning of new developments. The FEH Web Service lies at the heart of the current FEH methods, providing online access to the catchment descriptors and rainfall model outputs needed to carry out flood risk assessments. The original FEH CD-ROM software was updated to the FEH Web Service in November 2015. "The essential tool for civil engineers, housing developers, insurers and others for rainfall and river flood frequency estimates in the UK"
The improved method used in the new product provides even more accurate runoff estimates from point sources using the Revitalised Flood Hydrograph (ReFH2) method. The ReFH2 design hydrograph method is the most up-to-date version of the FEH’s rainfall-runoff approach to flood estimation. Design storm estimates are routed through a catchment, resulting in estimated peak flow and runoff volume. ReFH2 software streamlines application of the method to just three stages, and allows greenfield and post-development runoff peaks and volumes to be compared side-by-side. ReFH2 replaces the original ReFH method and the FSR/FEH rainfall-runoff method described in FEH Volume 4. The FEH Web Service is a product of the Centre for Ecology & Hydrology, and is developed and maintained under contract by Wallingford HydroSolutions. The Flood Estimation Handbook was published in 1999 in the form of a five-volume handbook providing practical guidance on the use of flood estimation methods, together with details of supporting theory and analysis. The handbook was accompanied by software and digital data, allowing users to estimate flood frequency for any site of interest on the UK river network, whether gauged or ungauged. Since its initial release, the FEH data, methods and software have been revised and updated, and a number of publications have superseded parts of the handbook itself. However, the core philosophy has been retained. The FEH Web Service was launched in November 2015.